I have waited for a long time to catch my breath and get the force to write this story. Well, it’s not quite a story, but more a compendium of my personal impressions of my short journey to Japan. As a travel photographer, I have quite a few photographs and I still work on them, selecting them, processing them. Sometimes I just leave them as they are, SOOC (straight out of camera). I realize this is not just „another” travel article, like the previous ones. I’d like to put it in a chronological order and maybe tell the world what was interesting in my trip, day by day. The journey to Japan was a dream I was dreaming since I was a teenager. The culture, the traditions, the history, the technology, the so-much-different aspects were like a magnet to me. I had a collection of photos with Japan and from time to time, I enjoyed watching them in a slide-show with some chill-out musical background. A perfect moment to remind myself what is the ultimate traveler dream. After so many years of waiting, it happened this year. End of April, beginning of May – the perfect time to travel to Japan, in the company of my best friends and what a wonderful opportunity to celebrate my 40th anniversary – There! From Heathrow – London to Narita Airport – Tokyo, the flight is about 12 hours. You get the chance to watch some new movies during the flight. We were 5 people on this journey. 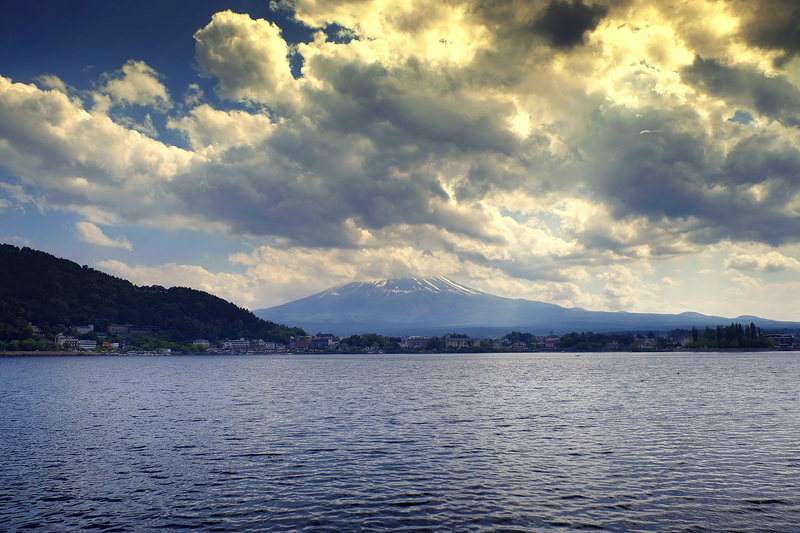 The feeling you are getting close to Japan gets really stronger when you see Mount Fuji from your airplane window. It’s so distant, so hard to photograph, but you know it’s there, like a guardian for this amazing country. Narita Airport was the place were we exchanged the JR PASS vouchers with the real JR Passes. With such passes you can travel on the Japan Railways by train without worrying about buying tickets. You can reserve places, for free, but we often traveled without reservations in the regular cars. You feel like going to another city? 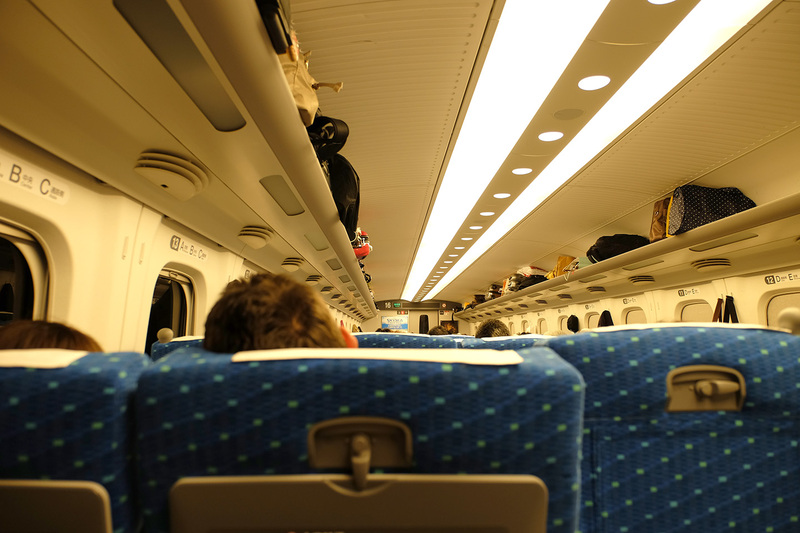 Just get in the train, regular or bullet-train, the famous Shinkansen. 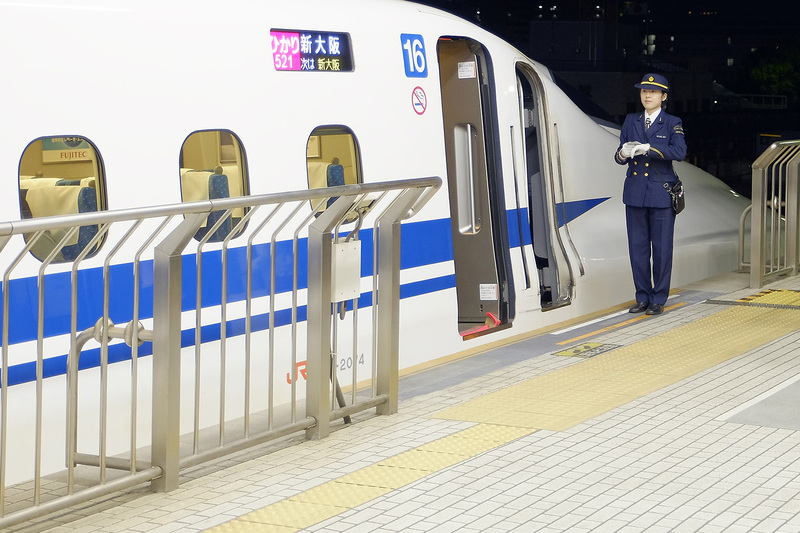 Excepting the Nozomi and Mizuho trains, we could travel with all the other train types on the JR lines. 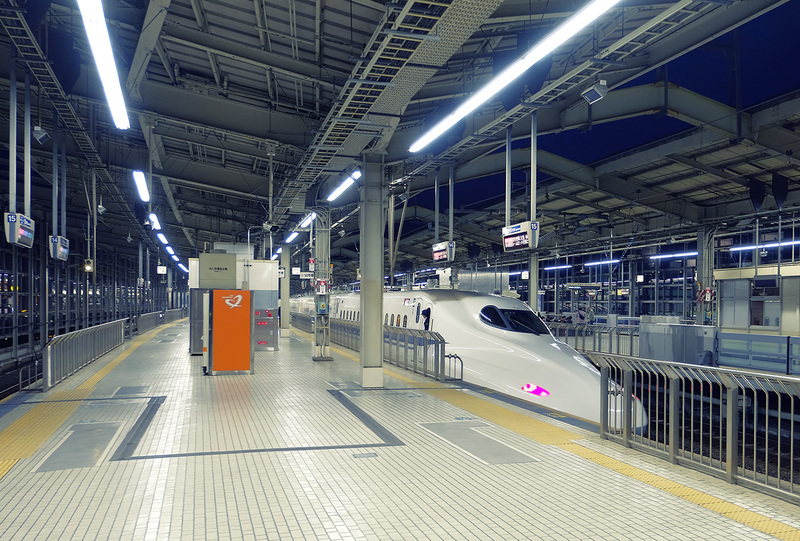 And if you intend to travel more than, let’s say Tokyo – Kyoto (2 way trip), the JR PASS just saves you real money. From Narita Airport we took the NEX line, a modern train that brought us to Tokyo Station. This is a big place underground with so many train and subway connections and this was the place when for the first time we split our group in two. 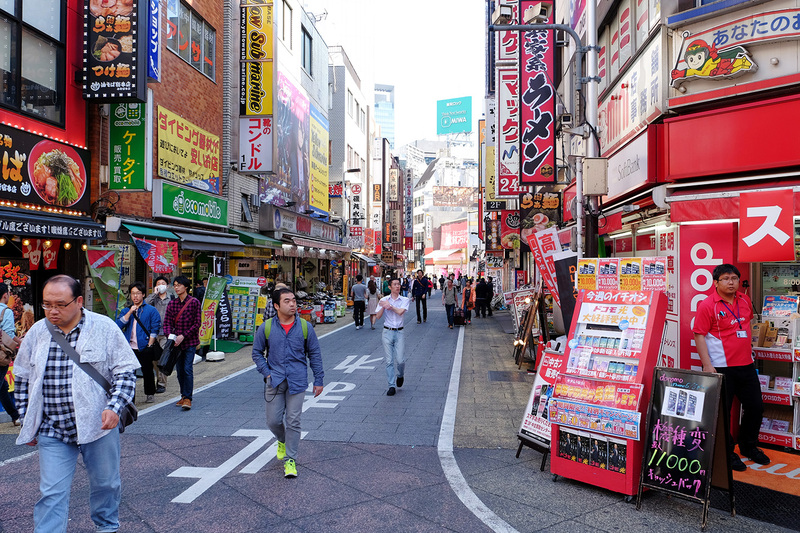 Me and Gabriel needed to go to Shinjuku. The other 3, my wife Anca, Adrian and Diana took the Shinkansen to Kyoto – our first destination and our city of residence for 9 days. Thanks to our JR Passes me and Gabriel took a train to Shinjuku Station. After just a few stations, we were outside, in the middle of an ocean made of people coming from all directions and going to all directions. This was my first step under the Japanese sky, on a hot and sunny day. Our destination? Map Camera. This is the place were my favorite camera store is placed. Thanks to my friend from Tokyo (professional photographer), I had a reservation made on my name, for a brand new camera and pro-grade zoom lens. And Map Camera was the right place, after comparing prices, shops, locations – thanks to the useful info I got from Bellamy from Japan Camera Hunter (many thanks!). 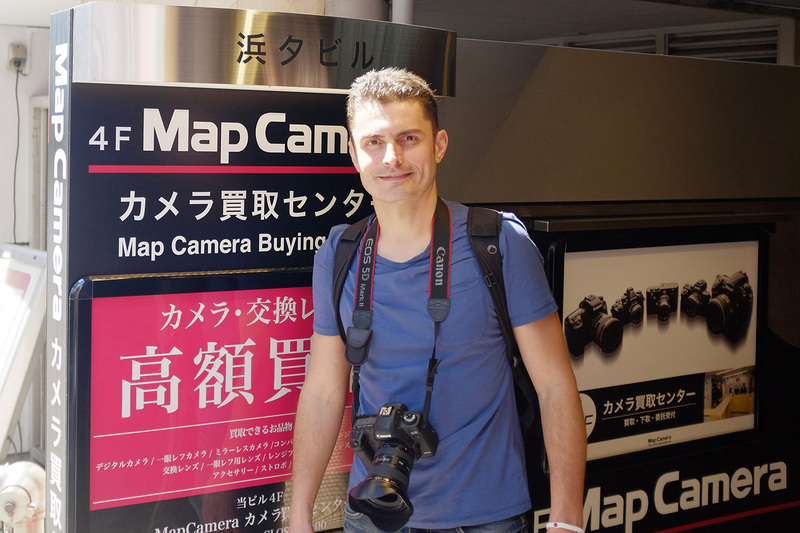 We took out our maps, smartphones with GPS and made our way to Map Camera, in a zone full of electronic stores. 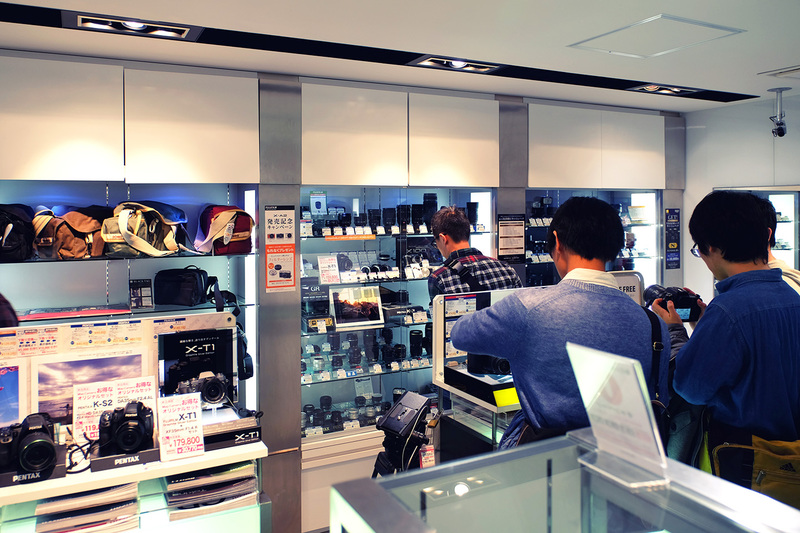 Here you can find Bic Camera and Yodobashi Camera – which are huge stores with plenty of photo equipment, but I find them more expensive. By foot, Map Camera is not far from the station. The people we ask for directions were very polite and helpful. Map Camera is a special place. A store on 5 floors I guess, each floor created for specific camera brands : Canon, Nikon, Olympus, Fujifilm, Sony, Panasonic, Leica. Gabriel was interested in Canon accessories (having his famous Canon 5D Mk2 with EF 17-40mm f4 L) and I was interested in Fujifilm (having on me just the small, but IQ powerful Fuji X100S). My reservation was for a brand new mirrorless Fujifilm X-T1 paired with a professional zoom, the fantastic Fujinon XF 16-55mm F2.8 R WR, but more on this in a separate, dedicated article. The people from Map Camera were kind, leaving you the feeling you would certainly come back to their store with great pleasure (which I did). As a tourist, I got my photo gear tax free, based on my passport. We left the store with a big smile on our faces, scouted the area for a while. So may stores that sell everything that requires electricity and the place is crowded with people, even at noon. 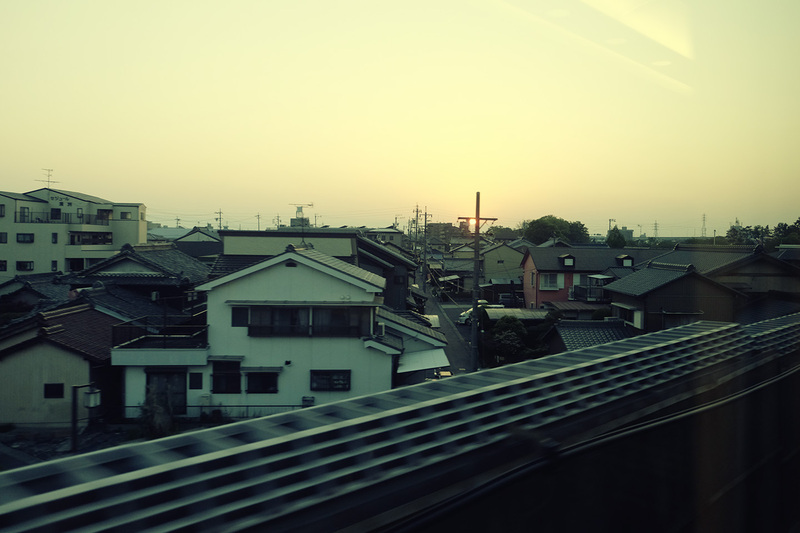 But we had to got back to Shinjuku Station and get the Shinkansen to Kyoto and join our friends. 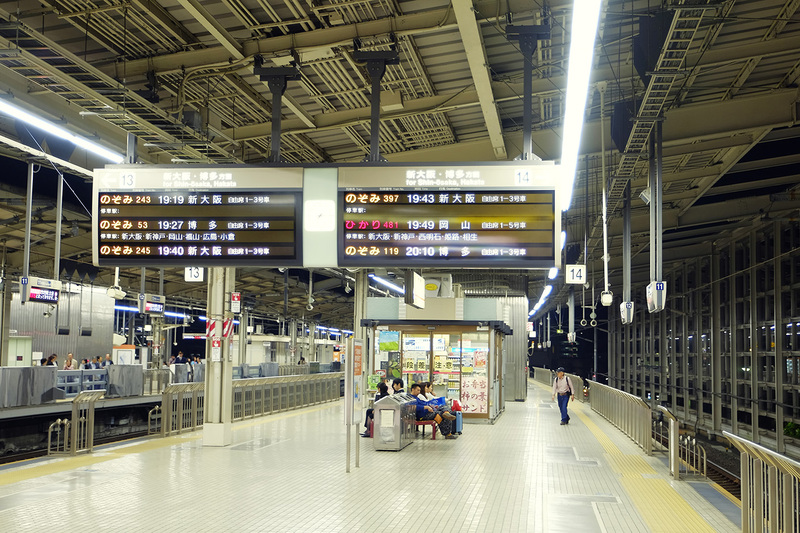 We followed the same route and arrived in Tokyo Station. We wanted to be sure we’ll have our seats reserved so we took the reservation and got into a train, the Hikari type. Coping with fatigue, we were pleased than things just went according to our plan. According to Hyperdia, the website you want to check for train timetables, the trip from Tokyo to Kyoto, with Hikari Shinkansen takes 164 min. Not “so bad” for a distance of 514 km. This trip, without the JR PASS, would cost 8.210 yen (a little over 60 euros). And the ride was indeed smooth, fast and very comfortable. Plenty of space for our tired legs. We wished we had the same space in the airplane! 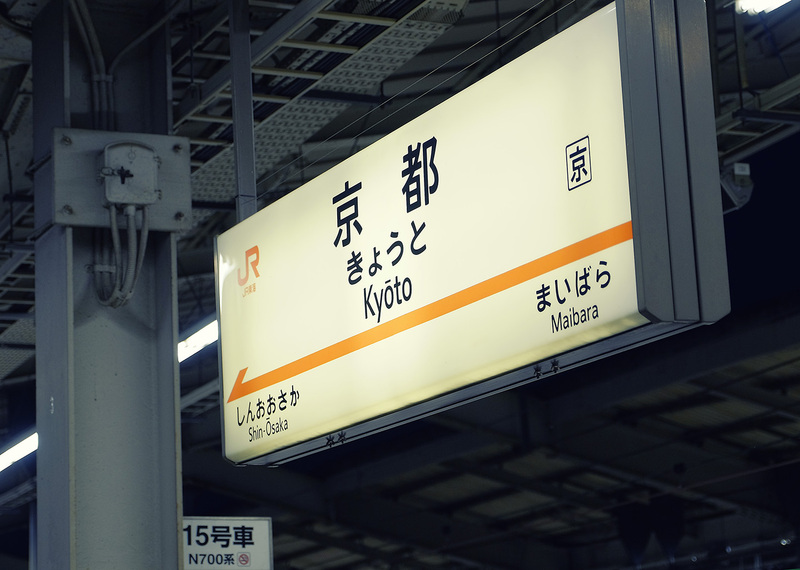 By the time we arrived in the huge and crowded Kyoto Station, the night felt rapidly over the city. We went outside, stayed in the line, waiting for a taxi and got inside the spacious car. Our ride was about 1.700 yen (about 13 euros), not until the driver tried for almost 10 min to figure out our destination, even if we had a map, an address, a number, a name, both in English and Japanese. It seems they use a system of landmarks, an internal map of important points, buildings, names and institutions. If you say your hotel name or you live just in front of the hospital, it’s easier than having the complete address. Our accommodation was not in a hotel, but in a building with apartments to rent. After all this mental calculations, the driver started the engine and he seemed pretty determined and sure about our destination and its location. When we arrived, Adrian was waiting for us in the street, in front of our building so it was quite easy. We payed the driver (of course the „keep the change” system does not work in Japan – you get your change everywhere and you pay just the exact amount you have to pay – fair and square), took our luggage and rejoined the group in one of our super-small rooms, that kind of room that gives you the feeling you live on a cheap ferry-boat. It was perfect! It was the time for a quick meal from Family Mart and a local beer, Asahi (remember – Family Mart is your friend, as one of the best convenience stores in Japan). We shared our first impressions – we were really tired, but happy. 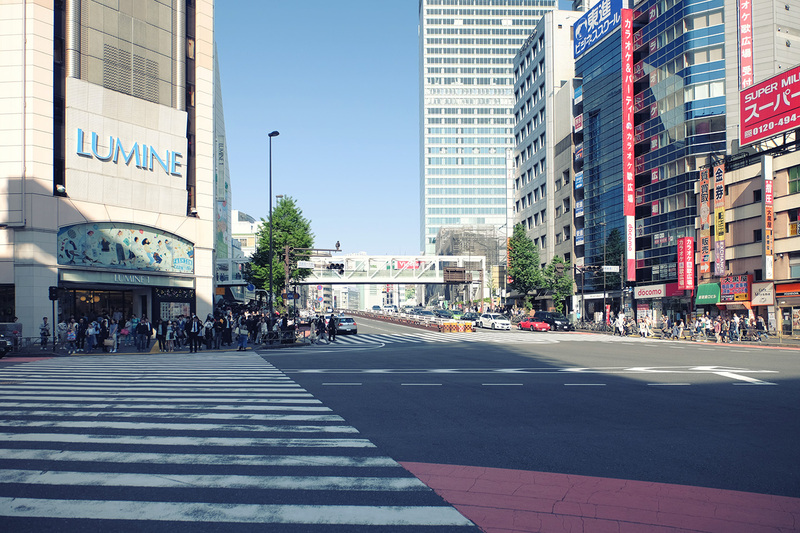 This was our first night in Japan – I should call it “day zero”. The adventure was about to begin, only after a good night recovering well-deserved sleep.